Advantage Spurs going into the second-leg which will be held in just over two weeks time in Dortmund. 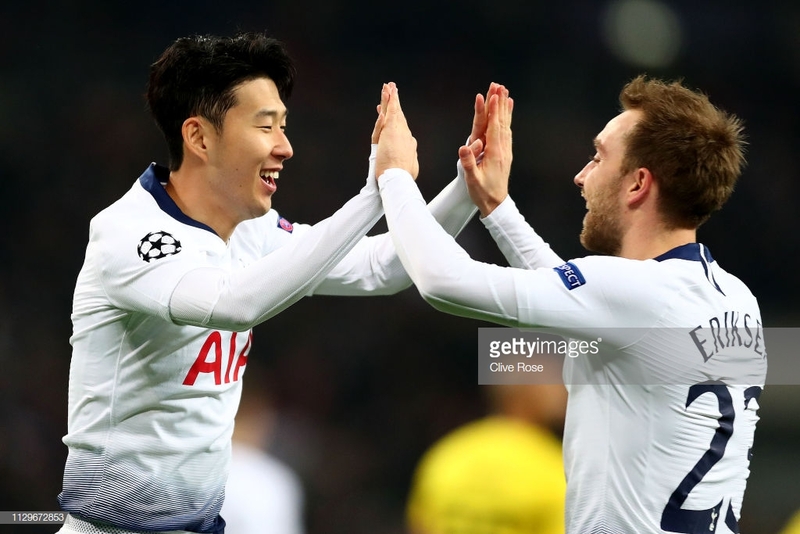 Tottenham Hotspur came to life in the second half to stun Borussia Dortmund and gain a 3-0 advantage going into the second leg. Goals from Heung-min Son, Jan Vertonghen and Fernando Llorente separated the two sides after what was a fairly even first 45 minutes. Spurs now take three huge goals into the second-leg at the Signal Iduna Park in just over two weeks time. Danny Rose was sidelined through injury but in his place was Jan Vertonghen and the Belgian certainly showed his class in the second-half. After a half-time tweak from Mauricio Pochettino, Vertonghen found himself further up the field having a greater effect on the game. The opening goal came through his simply stunning cross to which Son finished elegantly. As far as crosses come, this one was inch perfect. Vertonghen had the task of marking the Bundesliga 'wonder-kid' Jadon Sancho and the Belgian silenced the youngster in the second 45 minutes. To top off what had been a solid performance from the 31-year-old, with just under 10 minutes to go Vertonghen doubled Spurs' lead. Vertonghen caught the Dortmund defence napping and got on the end of a sumptuous cross from Serge Aurier and Vertonghen thumped his volley past a helpless Roman Bürki. An incredible performance from Tottenham's 'Super Jan' and a performance which earned him the UEFA Champions League Player of the Week. In the absence of Harry Kane through injury many worried Spurs would not be able to find the goals to keep them in the race for the top four. However, an early return from Son after South Korea were eliminated from the Asia Cup saw the Korean revive Spurs' title hopes. Even with Son back, many feared he would struggle to find goalscoring form after a busy schedule in Asia but he hit the ground running - scoring in all four of his games since returning. On Wednesday, Son started what became a Spurs rout. The home side were beginning to take a hold of the game for the first time and it was the former Bundesliga player who put his side ahead. Spurs will take a three-goal advantage over to the Westfalinstadion on 5 March. Surely that would seem game, set and match for Spurs? Well, the German leaders have scored 17 goals in their last six home games. We saw Dortmund beat Atletico Madrid 4-0 at home in the group stages this season so you can not write them off just yet. However, should Spurs get an away goal it would need the Germans needing to score five goals in order to progress to the quarter-finals. With just under three weeks until the second leg is played both sides will also hope to have key players return from injury. Harry Kane and Dele Alli are expected to be back in time and Dortmund should have Marco Reus and Paco Alcacer back as they search for some much goals.